Figure 1. 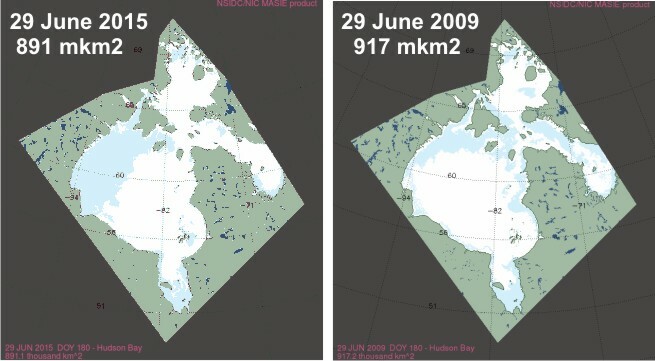 Left, Sea ice coverage and locations of female polar bears with tracking collars for 30 June 2014 (black, Western Hudson Bay bears; blue, Southern Hudson Bay bears), courtesy Alysa McCall, Polar Bears International; Right, sea ice coverage for 30 June 2015, cropped from the CIS daily map. Click to enlarge. I didn’t talk much about Hudson Bay breakup last year because I was traveling overseas. However, official breakup occurred around 1 July (using the new, 30% method), with most bears onshore about 2-3 weeks after (Cherry et al. 2013). Note that two bears on the 30 June 2014 map (Fig. 1) were out in the middle of the bay – some bears actually move around quite a bit, although others are more restrained in their movements (Parks et al. 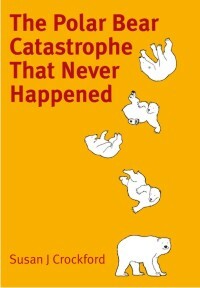 2006; see also previous post). At least three of McCall’s subjects last year appeared to be in open water – an example of the famous “20% of collared bears on ice that doesn’t exist” phenomenon (see previous post here). “The map below from scientist Alysa McCall at the University of Alberta shows that one polar bear from each population is now on land (Bear I for the Western Hudson Bay population, Bear F for Southern Hudson Bay). Bear I is on the coast just north of Churchill. McCall says that the ice is breaking up rapidly now, so by next week more polar bears will probably be onshore. This year it’s a whole new ball game. Compare ice coverage this year and last (in Fig. 1), to 30 June 2013 (Fig. 2, below). There was much more open water in the east in 2013 but less in the west. Breakup in 2013 was later than average. Figure 2. Sea ice extent in Canada, June 30, 2013. From the Canadian Ice Service. 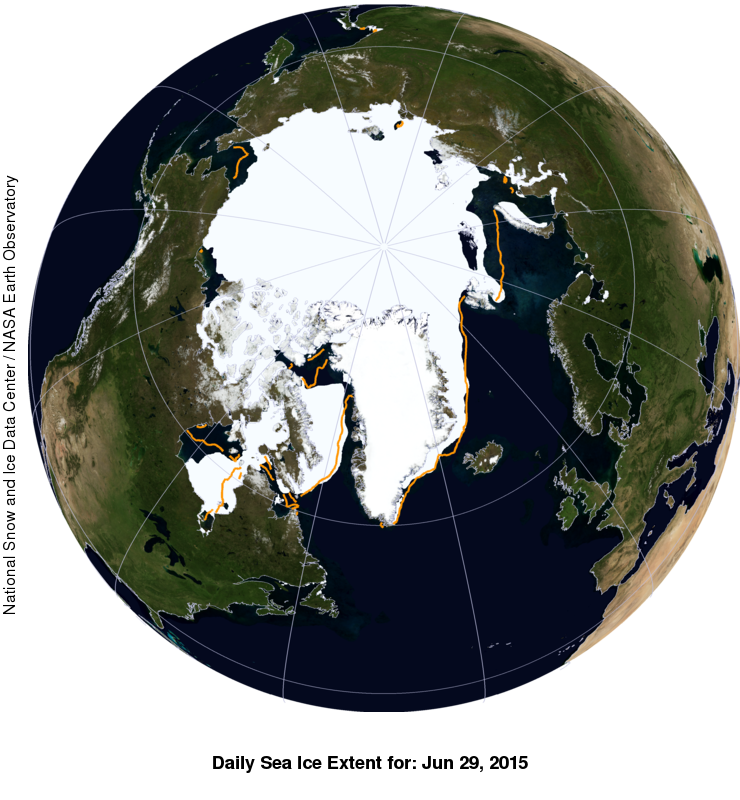 Sea ice coverage on Hudson Bay, according to NSIDC (Fig. 3), is the highest it’s been at this date for the last 5 years at least (they only show five years). Figure. 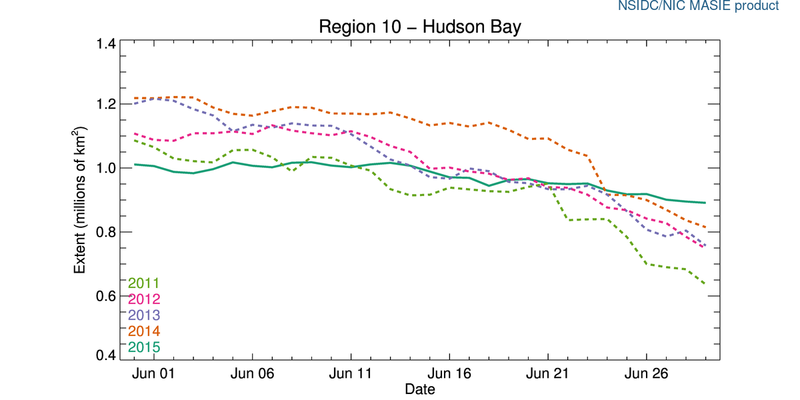 3 Sea ice extent for Hudson Bay for 2011-2015 at June 29. NSIDC. Click to enlarge. Melt proceeded rapidly after 30 June last year (Fig. 4) – but notice how many bears appear to be on the remnant ice at 8 July, even though it doesn’t look like there’s much present. Figure 4. 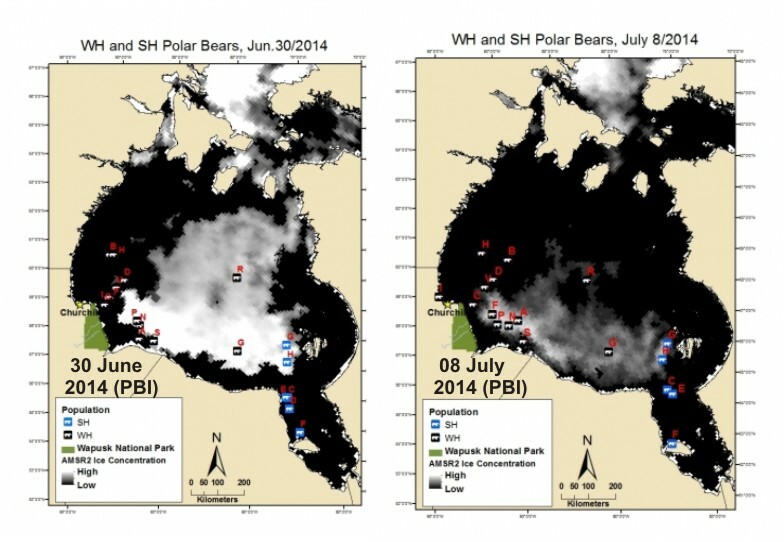 Sea ice coverage and locations of female polar bears with tracking collars for 30 June 2014 and 8 July 2014 (black, Western Hudson Bay bears; blue, Southern Hudson Bay bears), courtesy Alysa McCall, Polar Bears International. Click to enlarge. And as is usual for this date – the official last day of Arctic spring – there is still sea ice present in every one of the 19 subpopulation regions (Fig. 7), with at least 30-40% concentration – even on Hudson Bay (Fig. 5). Figure 5. Sea ice concentration estimates at 30 June 2015. Courtesy NRL. Click to enlarge. Virtually all of this ice is estimated to be greater than 30 cm thick (Fig. 6), which is plenty thick enough to support a full grown male polar bear. 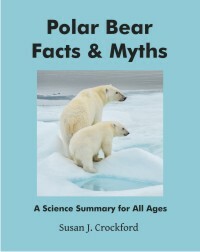 Work on polar bears in the Canadian Arctic around Baffin Bay (Ferugson et al. 2000) has shown that the bears routinely hunt on ‘young ice’ (0.1-0.3m), and there’s no reason to assume they would not use melting ice of similar thickness as well. Figure 6. Sea ice thickness estimates at 30 June 2015. Courtesy NRL. Click to enlarge. Figure 7. Sea ice extent at 29 June 2015. Courtesy NSIDC and WUWT Sea Ice Page. Click to enlarge. Figure 8. 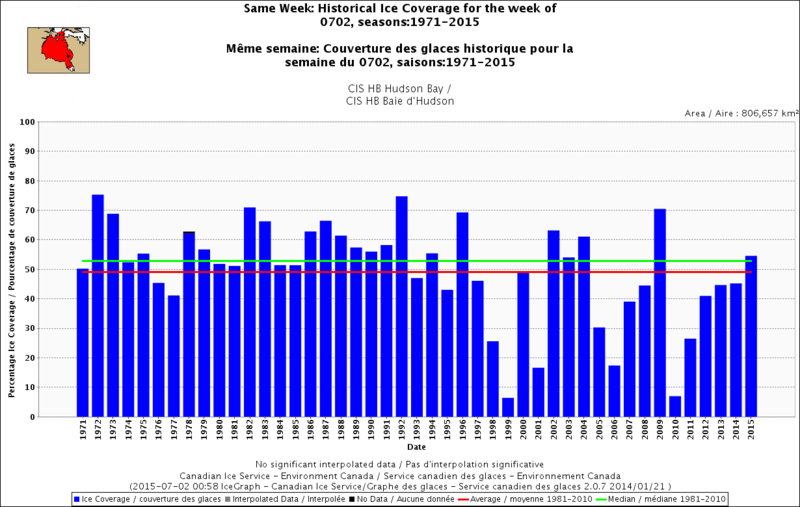 Hudson Bay sea ice coverage, 1971-2015 for the week 2 July. CIS. Click to enlarge. Figure 9. 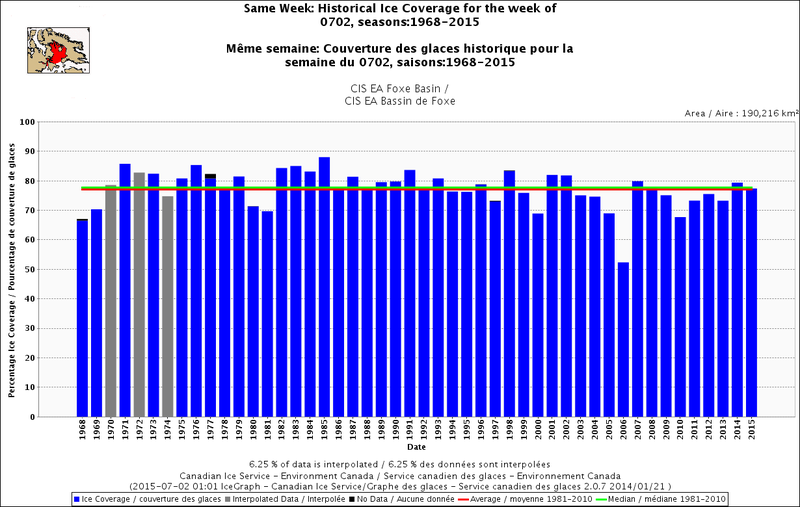 Foxe Basin sea ice coverage 1968-2015 at 2 July. CIS. Click to enlarge. And finally, ice in the northern half of Davis Strait (Fig. 10) is well above average this week and the highest it’s been since 1994 (and higher than 1971)! Figure 10. 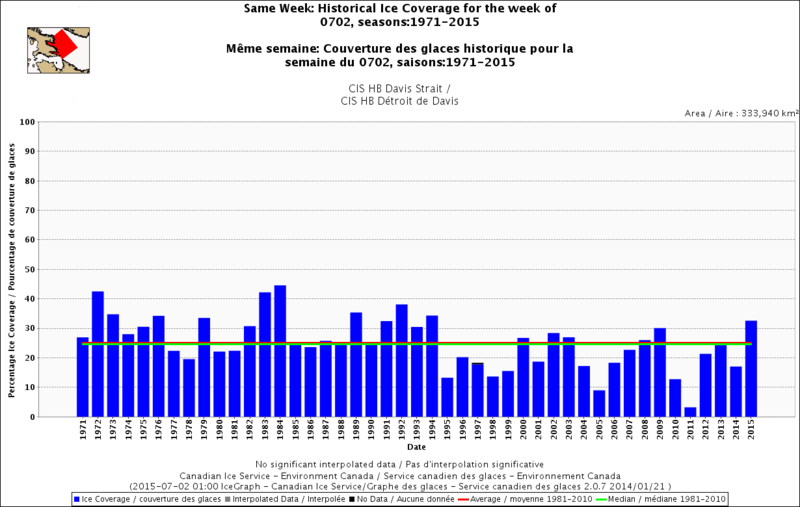 Davis Strait sea ice coverage 1971-2015 at 2 July. CIS. Click to enlarge. Parks, E.K., Derocher, A.E., Lunn, N.J. 2006. 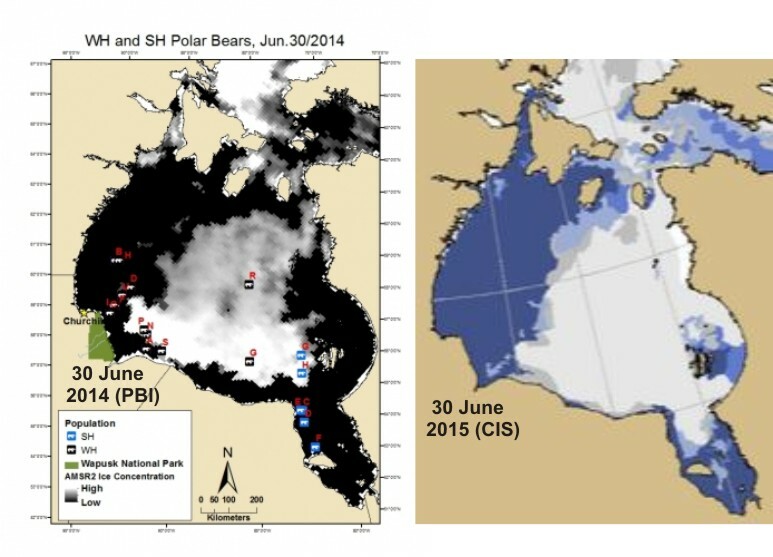 Seasonal and annual movement patterns of polar bears on the sea ice of Hudson Bay. Canadian Journal of Zoology 84:1281–1294. 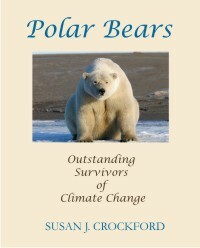 This entry was posted in Uncategorized and tagged Arctic, breakup, Cherry, CIS, Derocher, habitat, Hudson Bay, ice melt, McCall, NSIDC, polar bear, Polar Bears International, satellite collars, science, sea ice, sea ice concentration, Southern Hudson Bay, western hudson bay. Bookmark the permalink.